The evening celebrations were slated to be even more spectacular. (See evening schedule). In addition to a procession of the three mighty ships leaving the harbor, Britain’s precision aerial display team, the Red Arrows, were scheduled to perform over Southampton harbor at 6:20 p.m. This would be followed at 10:20 by a fireworks display. The weather, however, refused to cooperate. Instead of brightening, heavy showers had rolled in from the sea by mid-day. Towards evening, the showers had become less steady but the clouds still hung low over Southampton. Because of the low ceiling, the Red Arrows’ performance had to be cancelled. 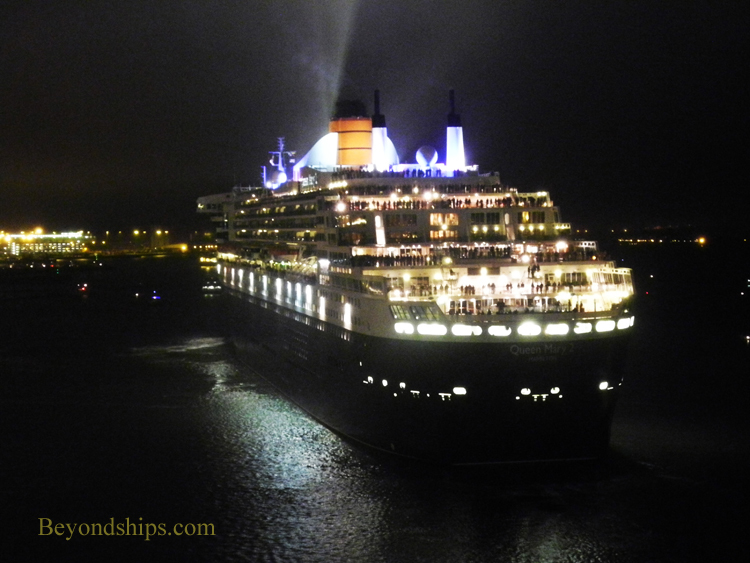 After darkness fell, Queen Mary 2 left her berth at the Ocean Terminal and repeated the maneuver that she had made that morning. She traveled down the harbor past Queen Elizabeth and Queen Victoria to the turning basin. After completing a 180 degree turn, she came back up the harbor and stopped next to Queen Victoria. 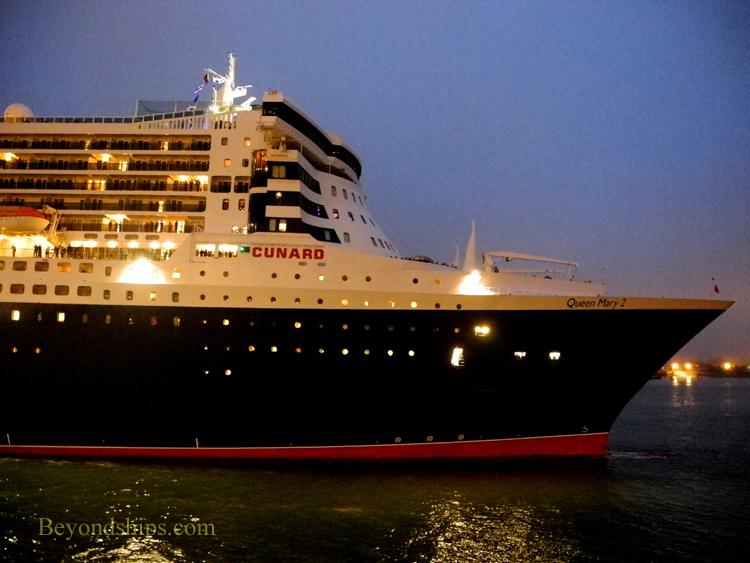 From the promenade deck of Queen Victoria, the sight of QM2 emerging from the darkness was a spectacular sight. In order to enable the bridge team to see, there were no lights on the front of her superstructure. As a result, she was illuminated only by the lights on her sides and by the reflected light from the other ships. This made her look even more massive than she does in the daylight. Furthermore, in the confined waters of the harbor, she was much closer as she moved by than one typically sees a passing ship. When QM2 took up position next to Queen Victoria, the three ships were once again close together with their bows in formation. This again resulted in the sounding of whistles and cheering. Immediately below: QM2 executing a 180 degree turn. Below right: QM2 returning to the other Cunarders. 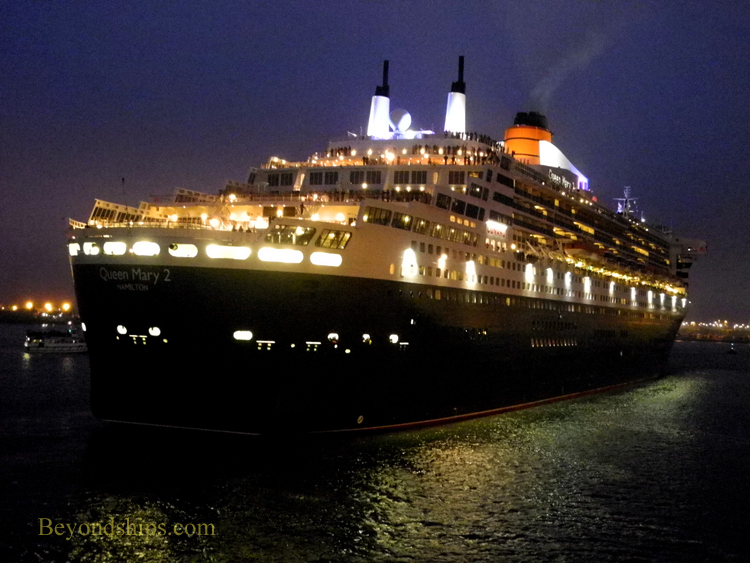 Above: Queen Mary 2 emerges out of the darkness during the evening celebrations. Below: QM2 passes close by Queen Victoria. Above: Fireworks colouring the low clouds. Below: The fireworks display over, QM2 heads toward the Solent and out to sea. Below Queen Elizabeth waits as Queen Victoria passes by. Although there were low clouds covering the harbour, the decision was made to proceed with the fireworks display. Many of the pyrotechnics exploded in the clouds turning them red, white or yellow for an instant. However, others exploded below the clouds illuminating QM2, which was the closest of the three to the fireworks. Classical and patriotic British music played over the three ships’ public address systems. 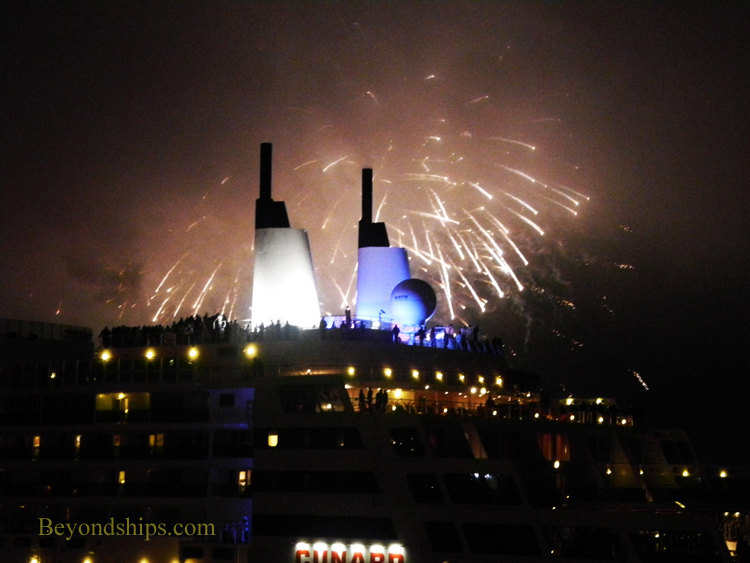 After the fireworks finished, QM2 exited the harbor. She was closely followed by Queen Victoria, which had cast off from her berth before the evening celebrations began. The two ships sailed by the brightly lit Queen Elizabeth, which was still pointed in the opposite direction. Then by the celebrants at Mayflower Park who had defied the rain to see the three Cunarders together. Having paid their respects to Her Majesty, the three ships returned to the sea.